***SOLD*** 18 C ANTIQUE OTTOMAN ORIENT IRON BALANCE / SCALE / WEIGHING MACHINE B..
18 TH C ANTIQUE IRON HORSE BIT Up for auction is this horse bit! It is in excell..
18 TH C PRIMITIVE ANTIQUE WROUGHT IRON BLACKSMITH HAND FORGED FIREPLACE CHAIN Very we..
2.2 Lbs 17 TH C BEARDED STEEL AXE / HATCHET HEAD -HAND FORGED ..
Definitely made by skillful blacksmith! Made to be theft proof. 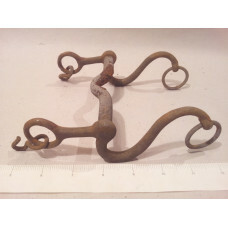 A horse..
***SOLD*** LOT OF 18 TH C ANTIQUE IRON HORSE STIRRUPS & HORSE BIT Up for auction is th..
18-TH C PRIMITIVE AUGER OLD ANTIQUE WOOD WOODWORKING FARM LOG CABIN DRILL TOOL ***SOLD.. ANTIQUE IRON BALANCE FROM THE LATE 19C BALANCE IS MADE OF IRON AND DATES BACK TO THE END.. PRIMITIVE HAND CARVED WOODEN BOWL ***SOLD***This item is not available for sale Dear buyer..